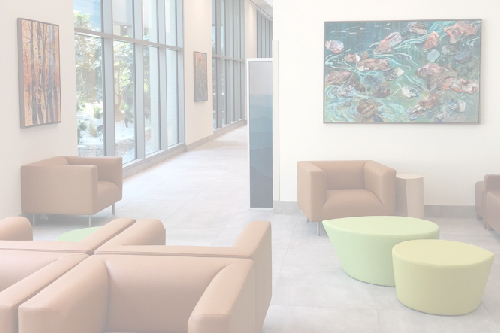 Grigio provides design and curation of artwork for healthcare and corporate clients with a goal of transforming spaces into experiences. We cultivate a highly curated network of artists, designers, fabricators, installers, and framers to support our projects, giving clients a unified point of contact for their art vision while providing built-in project management. Our team has completed over 200 projects totaling over $3M in art placements, with experience in OSHPD, ADA, and secure methods of installation, as well as the specific needs of different healing environments (oncology, pediatrics, senior care, etc.). We are forward-thinking with our popular Artfolio App that maps a building’s art collection and provides interactive experiences with the art. While our network is international, we also value the inclusion of local artists in our projects and will work with your community to integrate themes that resonate with the people who use your space. We understand that art provides a valuable first impression and an opportunity to enhance your brand and communicate your company’s values. With the right art consultant, you can open a world of art possibilities. Full-service project management from initial design development through installation. Coordination with a management team or committee, architects, interior designers, engineers, signage, construction, and office staff. We present a variety of artist portfolios and collaborate with clients to develop a concept for custom artwork that fits their vision and desired budget. Artwork recommendations and on-site curation for a new or existing collection. Custom framing or display, including moulding, matting, glass, plexiglass, and/or other materials as required for different types of artwork and different locations. Safe and professional storage, delivery, and installation of artwork of any medium. Cataloging of an existing collection and providing value estimates for inventory or insurance purposes.